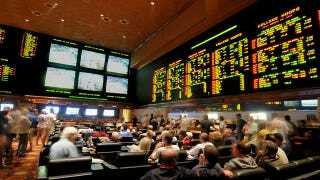 New Jersey's fight to legalize sports betting at casinos and race tracks may be heading to the Supreme Court, after the U.S. Third Circuit Court of Appeals in Philadelphia denied the state's request to have the issue heard by the court's judges. This is so stupid. Chris Christie and the rest of New Jersey have 90 days to appeal to the Supreme Court, which wouldn't necessarily have to hear the case but, at this point, New Jersey has no other chance. The case stems from a lawsuit filed last year by the NCAA and the nation’s four major sports leagues. The leagues pointed out that the U.S. Professional and Amateur Sports Protection Act of 1992 prohibits states from legalizing or regulating sports betting, and they said New Jersey’s attempt to do so would hurt sports in America. Yes, it would hurt sports in America for an industry that wouldn't interfere with sports at all (if the right safeguards were put into place) to exist. Of course, it hurt sports when Tim Donaghy was rigging games, or when the Black Sox threw a World Series, or when Pete Rose bet on his own team's games, or when college athletes shaved points to make money the NCAA refuses to pay them to this very day. Sports betting wasn't legal in America then, either, but those bad things still happened. Obviously, the legality of sports betting isn't what will hurt sports. Sports leagues choosing not to want to properly safeguard themselves from gambling related corruption is what hurts sports, and that laziness has existed in sports since 1919, and probably even before then. Whether sports betting is legal or not, people are going to gamble on sports. They are going to bet on games with their friends. They are going to use their local bookie. They will deposit money into an international wallet to make deposits into offshore sportsbook accounts. No amount of laws can possibly stop Americans from doing these things. So, I'll ask again: what is the harm in legalizing sports betting already?